A DIY guide of the electric water heater maintenance and how cleaning and tune-ups can prevent or reduce problems such as the noise, sediment buildup, no hot water, not enough hot water, low pressure, stinky water, and other. It is important to know that the properly maintained water heater ensures excellent performance and efficiency, dependable, long-term and worry-free operation. An electric water heater does not have a complicated design as the gas counterpart, so it is simpler and easier to maintain it. Some work can be done by the homeowner, while more complicated, especially when the electrical work is involved, should be done by the licensed contractor. If you do not want to read this step-by-step guide and just want it done - contact a plumber. First of all, our suggestion is to read the manufacturer’s manual carefully; the best will be a day before you perform the maintenance, so that you can prepare all the necessary tools. Visual inspection is the first thing you want to do. This involves checking for any leaks, corrosion, obstructions, deformations and other unusual conditions. Leaking, for example, is mainly coming from the rusty storage tank and lose connections and it results in a water puddle at the base of the unit. One of the major problems with the tank-type electric water heaters are the mineral sediments, dirt and deposits sitting at the bottom of the heater. Most of the user complaints are related to hard water, the main cause for this kind of a problem, which is affecting the efficiency, hot water output and durability of the heating unit. The hard water and similar issues are related mainly to home plumbing that is attached to the well systems. What could prevent the sediment buildup within the heating system is the installation of the water softener. Of course, this has pros and cons. If this is not an option, then the regular electric water heater maintenance might be adequate, if done correctly and frequently. It is suggested by experts to drain 1-2 gallons every month and clean the tank from dirt. Draining is a simple operation which helps the heating system run smooth. 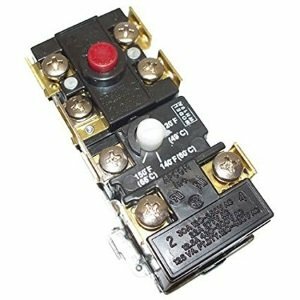 The drain valve is located at the lowest point of the electric heater. Before you start the maintenance, turn off the water using the shut off valve, and electricity on the circuit breaker. You will need a garden hose and a bucket, and if water is still hot, gloves. Connect one end of the hose to the drain valve and the other to the floor drain or outside. Open the valve to release the water from the electric heater. Open a pressure relief valve so that air can get into the tank, and water can drain out smoothly. The other way is to open the nearby hot water faucet. Don't be surprised if you see dirty (brownish) water, it is normal. This is because of all the minerals and sediments that had built up. Depending on the capacity of the storage tank, it can take several hours before the tank is empty. Flush the rest of the sediments out by turning on the cold water to the tank and turning off the hot tap. When the drained water is clear, you are done. To refill the tank again, close the pressure relief valve and drain valve and open the main water valve to let the water in. The tank has to be full of water before resuming the power. You can also follow the detailed instructions found in the articles about draining and flushing. Draining and flushing will also remove the scale build-up from the heating elements, so the energy transfer is as high as when the unit was purchased. Draining/cleaning will also eliminate the hissing or singing sound produced when the heating elements are covered with the limescale. Alternatively, you can refer to this guide and check out how to remove the heating elements. Once removed, use a vinegar/water solution to remove the scale buildup. Check the settings on the thermostat – you want it in the range from 120-125 F, which is factory set to prevent scalding burns and reduce the high energy bills. If the water heater is older, than put an insulation blanket around the tank to reduce the energy loss. 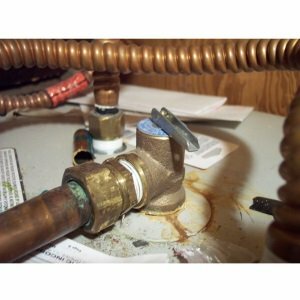 An anode rod protects the water heater from corrosion. It is known as the sacrificial rod for a reason. It sacrifices itself (deteriorates), so the metal tank is protected from the aggressive water action. It is made of steel coated with magnesium or aluminum-zinc compound, softer material, so that it can be used up before the metal tank. It can last an average 5 years, sometimes longer (depends on the water quality and usage), so if not maintained regularly and replaced when needed, the lifetime of a water heater gets shorter. A simple checking of an anode operating status, as part of the regular unit maintenance, can make the difference in the unit’s condition and performance. Also, the proper selection of an anode, when replacing the old, can make the difference between the rotten egg smell and no odor. 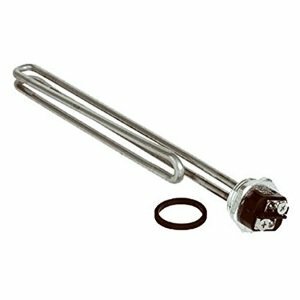 An anode rod, which is installed on top of the heater and submerged into the water can be easily removed for checking, using the right tool, such as the wrench or 1 1/16 socket (most often). Before you remove the rod, turn the power off on the circuit breaker and shut the water off on the main valve. Drain a few gallons of hot water through the drain valve, and only then you can remove it. Inspect the rod and if more than 6” of the core wire is exposed on either side of the anode, replace it. 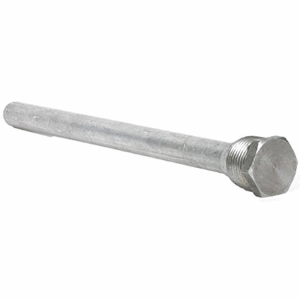 Refer to an article that explains how to replace an anode rod and get more information. Some manufacturers recommend frequent inspection – at least once a year, but it depends on the water quality, like hardness, and usage of the water softener. The dip tube or the cold water inlet is used to bring the cold water inside the water tank heater. 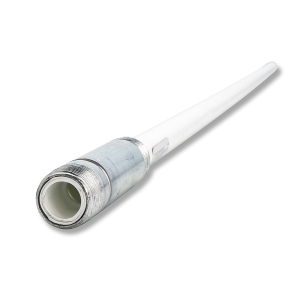 Cheaper heaters have low-quality dip tubes, while more advanced have better dip tubes that can last longer and help in reducing the scale buildup inside the tank. As the water heater ages, the dip tube, as the other elements, loses its functionality and can break, crack or split. So instead of bringing the cold water to the bottom of the tank, the deformed tube does it at the top of the heater, where it mixes with the hot water and delivering not as much hot water, resulting actually in cold showers. As the element is brittle, it can break into small pieces, leaving the white fragments clogging the fixture aerators and other elements, affecting the unit’s efficiency and performance. Taking into account the above, it is important to inspect the dip tube at least once a year, or when experiencing the problem such as described above. Removing the dip tube for testing or replacing is easy, just follow the instructions. It is crucial to have the temperature and pressure relief valve working correctly – because this is a safety element that will protect the unit from an extreme pressure development. It is not recommended for repairs. It should be tested at least once in six months or often if there is a reason, such as a scale buildup due to hard water and well water supply. If the water is dripping from the TPR valve, and cannot be closed properly, then it should be replaced. If the TPR valve doesn't work, pressure, inside the tank can build up so high that will cause the damage, rupture of the unit, even explosion. Turn off the cold water supply to your electrical heater. Put a bucket under the drain tube of the pressure release valve. Lift the lever on the pressure release valve for a few seconds. If there is no vapor, air or water coming out, or it doesn't shut off, you have to replace it. Be careful with the vapor/water coming out is hot. Test the lever several times to ensure there is no debris which could prevent the valve from closing. Replacing the pressure release valve can be combined with the above step, when the tank is empty and before you flush the heater. To unscrew the TPR valve use the pipe wrench. If the heater is to remain idle for a while (you are on vacation or absent for some time, for example), the electrical power and water should be turned off. A water heater should never be left empty. A proper electric water heater maintenance is essential for efficient and economical water heating. It is not as difficult as maintaining the gas unit, but it still takes a few hours. With the above listed and explained procedures, maintenance becomes simpler, resulting in plenty of hot water and fewer problems and complaints.